I have flagged in many contexts my interest for new materialist cultural analysis, and how it should be articulated together with a new sense of temporality. When I say “a new sense” it’s a bit misleading, but I mean the rigorous rethinking of temporality that we find across the board from Delanda to Whitehead-inspired accounts and so forth. Whereas Grossberg already pointed towards a non-signifying accounts as a mode of spatial materialism, we need to develop similar approaches that stem from radical temporality; that the world outside the human being is too dynamic, unfolding, temporal; that temporality is itself folded together with the various material assemblages of the world; that temporality is a crucial non-human force we need to articulate to understand the molecular, as well as the long durations of nature (not least in the midst of our eco crisis). One key context for my interests comes again from Germany, and has been recently been “summed up” as a book. 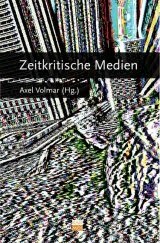 Axel Volmar as the editor of Zeitkritische Medien (Time-Critical Media, Kadmos Verlag, Berlin, 2009 ) has done a good job in collating together recent trends in German media theory, and approaches to the very peculiar, but even more so exciting version of media archaeology that they have been developing in the Media Studies department at Humboldt University, Berlin. Under the guidance of Professor Wolfgang Ernst, the notion of “time-criticality” and an eye towards temporal processes as a key to understand modern technic al media we find a brand of media archaeology that extends not so much historically into past media but towards the microscopic workings of media machines; and how they modulate time, and the structuring temporal processes of societies. By digging into the “microtemporalities” of media machines the introduction and the chapters try to excavate how such micro-layers are articulating the perception of reality. This means extending the media studies agenda (not surprisingly as we are in the territory of German, Kittlerian inspired media theory after all) to non-human agents and processes that however structure the phenomenological worlds of our perception and reality-effects as well. This leads furthermore to the realisation of the new realms of relations between machines themselves — no link to the human is always needed in the age of automated processes and machines communicating between themselves before they talk to the human (Guattari — who however is missing as theorist from this volume). Paul Virilio who is well used in this book has argued for the importance of time and speed for war (and hence a link to media as well), but this book extends this to a very meticulous technical excavation into the dispositifs of how actually time gets articulated and articulates media. Technophobes beware! This brand of German media theory is not afraid of getting its hands greasy, whether we are talking of analogue media or digital algorithms (or algorythmics as Shintaro Miyazaki extends the concept in his chapter). This is where Virilio’s ideas gain real strength, or a new context when by systematic and rigorous steps machines and technologies are opened up from the logic of bitmapping (Peter Berz) to the problems of noise and signal-transmission (Hirt and Volmar). It would be crucial to see more work of this kind in English in order to really start rethinking fundamentals of media studies. This is happening already, partly due to a Kittlerian influence, and other new waves coming e.g. from Italy (post-Fordist thought), France (e.g. Latour, Guattari, Deleuze of course) and onwards to e.g. games (Pias) with an amount of chapters that with ease move between visual media, the sonic and computational platforms. But definitely new German media studies and archaeology has a lot to say to the problems of materiality of technical media. It would benefit itself from a more elaborated discussion and joining of forces of some other similar approaches that come from different directions. Ideas of temporality have been developed e.g. in materialist feminism (Barad) and e.g. Whitehead inspired radical empiricism (Massumi, Mackenzie,etc.) and through creations of new circuits for circulation of ideas, we could have soon something really exciting on our hands. Well, the previous sentence was not to mean that all this stuff is not already that — exciting. Just that developing such creative clashes might be seen as a good method for movement of thought. Of course, its not the Germans who are the only ones doing this work; recently I have been following the stuff coming out from Utrecht direction as well whether in terms of some of the feminist work in the wake of Braidotti but also the great ideas from the New Media and Digital culture programme who also address materiality with historical, temporal methods. Anyhow, media studies is developing into a great articulation of the interlinks between science, art and cultural analysis/philosophy, and we need to keep this movement alive with more translations and engagements. Such are the directions where UK media studies field should turn its attention to.